Bundism was a secular Jewish socialist movement, whose organizational manifestation was the General Jewish Labour Bund, known in Yiddish as the Algemeyner Yidisher Arbeter Bund in Lite, Poyln un Rusland, founded in the Russian Empire in 1897. The Jewish Labour Bund was an important component of the social democratic movement in the Russian empire until the Russian Revolution of 1917; the Bundists initially opposed the October Revolution, but ended up supporting it due to the anti-Jewish pogroms by the White Army during the Russian Civil War. Split along communist and social democratic lines throughout the Civil War, a faction supported the Bolsheviks, and eventually was absorbed by the Communist Party. The socialist, anti-Communist Bundist movement continued to exist as a political party in independent Poland prior to the Holocaust (the Polish Bund), becoming a major, if not the major, political force within Polish Jewry. Bundists were active in the anti-Nazi struggle, and many of its members were killed during the Second World War. After the War, the International Jewish Labor Bund, more properly the World Coordinating Council of the Jewish Labor Bund, was founded, based in New York, with affiliated groups in Argentina, Australia, Canada, France, Israel, Mexico, the United Kingdom, the United States and other countries. Individuals associated with the Jewish Labour Bund played important roles in Western social democratic movements, such as Canada's New Democratic Party. 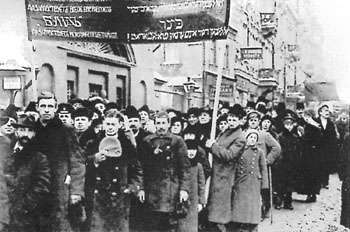 While the Jewish Labour Bund ["circle"] was a trade union as well as a political party, its initial purpose was the organisation of the Jewish proletariat in Russia, Poland and Lithuania. A staunchly secular party, the Jewish Labour Bund took part in kehillot elections in Poland. The Jewish Labour Bund, while not initially interested in the Yiddish language per se as anything more than a vehicle to exhort the masses of Jewish workers in Eastern Europe, soon saw the language and the larger Yiddish culture as a value and promoted the use of Yiddish (Yiddishism) as a Jewish national language in its own right; to some extent, the promotion of Yiddish was part and parcel of the Bund's opposition to the Zionist movement, and its project of reviving Hebrew. The concept of doikayt (lit. "hereness", Yiddish = do -kayt, German = da-keit, French = "ici-té") was central to the Bundist ideology, expressing its focus on solving the challenges confronting Jews in the country in which they lived, versus the "thereness" of the Zionist movement, which posited the necessity of an independent Jewish polity in its alleged ancestral homeland, i.e., Eretz Yisroel, of the Labor of Israel, to secure Jewish life. The Jewish Labour Bund did not advocate ethnic or religious separatism, but focused on culture, not a state or a place, as the glue of Jewish nationhood, within the context of a world of multi-cultural and multi-ethnic countries. In this the Bundists borrowed extensively from the Austro-Marxist concept of national personal autonomy; this approach alienated the Bolsheviks and Lenin, who were derisive of and politically opposed to Bundism. "Let us consider the case of a country composed of several national groups, e.g. Poles, Lithuanians and Jews. Each national group would create a separate movement. All citizens belonging to a given national group would join a special organisation that would hold cultural assemblies in each region and a general cultural assembly for the whole country. The assemblies would be given financial powers of their own: either each national group would be entitled to raise taxes on its members, or the state would allocate a proportion of its overall budget to each of them. Every citizen of the state would belong to one of the national groups, but the question of which national movement to join would be a matter of personal choice and no authority would have any control over his decision. The national movements would be subject to the general legislation of the state, but in their own areas of responsibility they would be autonomous and none of them would have the right to interfere in the affairs of the others". The Jewish Labour Bund, as an organization, was formed at the same time as the World Zionist Organization. The Bund eventually came to strongly oppose Zionism, arguing that emigration to Palestine was a form of escapism. After the 1936 Warsaw kehilla elections, Henryk Ehrlich created an incident by accusing Zionist leaders Yitzhak Gruenbaum and Ze'ev Jabotinsky of being responsible for recent anti-Semitic agitation in Poland by their campaign urging Jewish emigration. A branch of the Jewish Labour Bund was created in Israel in 1951, the Arbeter-ring in Yisroel - Brith Haavoda, which even took part in the 1959 Knesset elections, with a very low electoral result. Its publication, Lebns Fregyn, is still being published as of 2014. It is one of the relatively few left-wing Yiddish-language publications in existence. b) but it would mean that the affairs of the Jewish community in Israel should be subordinate to those of world Jewry. c) the policy of the state of Israel would be the same toward all citizens regardless of their nationalities. d) Israel should foster peace with the Arabs. This required halting territorial expansion and resolving the Palestinian refugee problem. e) Yiddish should be taught at all educational institutions and would be promoted in public life. The World Coordinating Council of the Jewish Labour Bund was quietly disbanded by a number of Bundists and representatives of related organizations, including the Workmen's Circle and the Congress for Jewish Culture in the early 2000s. The London-based Jewish Socialists' Group, which publishes the magazine Jewish Socialist, considers itself an heir of the historic Jewish Labour Bund. Mojżesz Gutman member of the Ukrainian Central Rada in 1917, then Minister without portfolio in the short-lived autonomous Belarusian National Council (1917–1918) and Belarusian People’s Republic (1918–1919). Moisei Rafes (1883–1942), member of the 1917 Russian Constituent Assembly and also of the Ukrainian Central Rada; member, as General controller, of the General Secretariat of Ukraine (the chief executive body of the Ukrainian National Republic from 28 June 1917 to 22 January 1918). ↑ Fuerstenberg, Adam. "The Marvellous Trajectory of David Lewis' Life and Career". Toronto: Beth Tzedec Congregation. Archived from the original on 19 July 2011. Retrieved 25 November 2009. ↑ Yiddish: Medem, V.‎ 1943. “Di sotsial-demokratie un di natsionale frage” (1904). Vladimir Medem: Tsum tsvantsikstn yortsayt. New York: New York: Der Amerikaner Reprezentants fun Algemeynem Yidishn Arbeter-Bund (‘Bund’) in Poyln, pp. 173-219. ↑ Gechtman, Roni (December 2008). "National-Cultural Autonomy and 'Neutralism': Vladimir Medem's Marxist Analysis of the National Question, 1903-1920". Socialist Studies. Thompson, Manitoba: Society for Socialist Studies. III (1). ISSN 1918-2821. Retrieved 2009-12-02. ↑ Plassereaud, Yves (May 2000). "Choose Your Own Nationality or The Forgotten History of Cultural Autonomy". Le Monde diplomatique. Paris. ↑ Grabsky, August (August 10, 2005). "The Anti-Zionism of the Bund (1947-1972)". Workers' Liberty. Retrieved 2009-11-10. ↑ Bunyan, James; Fisher, Harold Henry (1934). The Bolshevik revolution, 1917-1918: documents and materials. Stanford University Press. p. 735. ISBN 978-0-8047-0344-4. "The resolution of the tenth conference of the Bund, April 1917"